Bert is a 15 months old black sable male. He has a medium prey drive and would be great for family protection, breeding or someone seeking a lower drive sport dog. ​Greater top level of sport, breeding, as well as a family protection dog. father: Extreme Orex Aykmar 2.place worldchampionship IPO3 2017!! Oxana is a sable female imported from Czech Republic, titled IPO1. Oxana is a female with very high hunt/prey drive inherent from her father side, Kato Aritar Bastet, which was the world champion. From her mother side she inherited the old Czech border patrol and police blood which gave her the strong natural defense she has. She will be used in our breeding program to produce strong dogs with high drive and the willingness to work. Lucky is a Czech import, ZVV1 titled and SG3 rated (very good). She is a medium size black sable with very good pigment and dark eyes. Her blood lines consist of the old Czech border patrol lines and German lines. Her drive makes her puppies very suitable for sport and police work. She produces very large puppies with a high drive. Lucky is a serious dog with a confident temperament. Emina is sable female imported from Czech Republic, titled ZVV1. Emina belongs to the 2nd bloodline from her sire's side EX z Jirkova dvora and she carries blood of world-renowned working branch that is abundantly used also in law enforcement service - CAR po Molnosskou banou, CORDON An-At, ORI z Danaru, FURO Kamos, EX z Jirkova dvora. 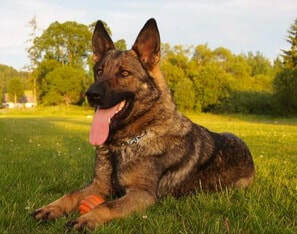 From her dam's side she belongs to the 3rd bloodline via world-renowned dog GRIM z Pohranicni straze and also Czech Republic National Competitors - DARGO Ha-Ja-Da, ATILA z KoÄiÄÃ­ho dvora. For these reasons we can classify her as a female with old Czech blood. EMINA herself is a hard female that is environmentally strong and that loves doing her protection and tracking. Vassco is a titled Czech import, has his hips and elbows certified excellent. He has a medium to high prey drive and loves to bite. He is good with other animals, dogs and is a very easy dog to handle. He has sired several litters. Wiking is a large black sable male imported from Czech Republic. He is title IPO1 with his hips and elbows certified 1/1 0/0. He is a very level headed dog with a high prey drive and medium food drive. Would be great dog to a person who is starting IPO training and wants for pursue with taking him all the way to IPO3. Would also make a great breeding male. 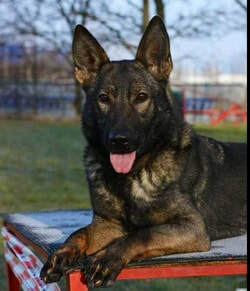 Lee is a medium size female imported from Czech Republic and is ZVV1 titled, with good temperament and drive for regional sport or hobby training. Lee is trained for sport in tracking, obedience and protection. She is socialized, has no problems with children, being out in public and with other dogs. She is a very athletic dog with an easy going temperament. Hips and elbows certified A1 normal. Togo Aites Bohemia is a Czech import, ZVV1 titled, SG (very good) rated and has a KKL1 breeding survey. 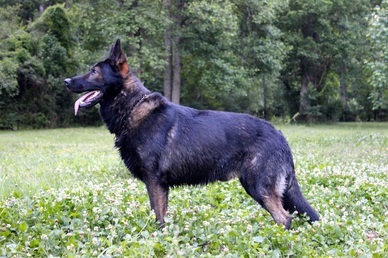 He is a black sable, medium size dog, with a very high defensive drive and medium prey drive. He is a very dominant dog and always wants to be in charge. He loves to please the handler and has a very confident personality. Togo will be used to produce dogs with very dark pigment, strong bones and a willingness to work. From his previous litters, the puppies are large with great temperaments and most of them have shown the same natural defense as he does. Nora is a solid black Czech Import female. She is a medium sized female that comes from very good old Czech bloodlines. She has a very high defense and loves to bite and also has a medium drive. She will be great as a family companion or as a breeding female to incorporate old blood Czech lines to a breeding program. Portos is a black sable male imported from the Czech Republic and is almost two years old. He has been socialized with other dogs, environments and people. He will be good for civil training, family protections or hobby sport. He doesn't have over the top drive. Portos comes from old Czech bloodlines.